J Crew Factory [jcrew.com] has a 70% Off Clearance Items (prices ending in $0.99) with code FULLBASKET. Sign up for a J Crew Factory Rewards Account [jcrew.com] (free to join) to get a 15% off unique code via email - or if you "linger" in the cart for about 30-45 seconds, you should get a pop up offer where if you enter email code will show up immediately. The email is received within about 5 min to gmail. Stack these discounts to get to prices below. Stay logged into your J Crew Rewards Account for free shipping. Items are final sale. Sizes will be limited by style/color. J. Crew Factory is offering an 50% off sitewide with promo code "FULLBASKET" (including sale styles). Shipping is free for Reward Members (free to join). J. Crew Factory is offering an extra 50% off clearance items with promo code "NOPRANKS". Shipping is free for Reward Members (free to join). Deal ends 4/2. J. Crew Factory has clearance items for extra 40% off and free shipping on ALL orders with promo code "FLASHSALE". Deal ends 3/12. 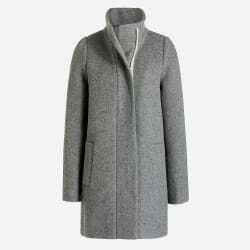 Ending today, J.Crew offers its J.Crew Factory Women's City Coat in several colors (Grey pictured) for $149.99. Coupon code "QUICKEST" cuts the price to $45. Plus, Rewards members bag free shipping on all orders. (Not a member? It's free to sign up.) That's $3 under last month's mention, $183 off, and is the lowest price we could find. It's available in select sizes from 00 to 24. 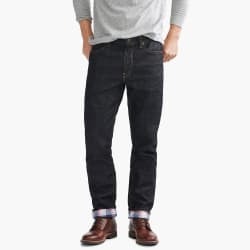 Ending today, J.Crew Factory offers its J.Crew Factory Men's Slim Fit Chino Pants in Deep Redwood for $29.99. Coupon code "QUICKEST" cuts that to $9. Plus, Rewards members bag free shipping on all orders. (Not a member? It's free to sign up.) That's $50 off and the best price we could find. They're available in select sizes from 29/30 to 34/34. 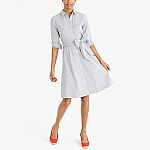 Ending today, J.Crew Factory takes an extra 70% off clearance styles via coupon code "QUICKEST." Plus, Rewards members bag free shipping on all orders. (Not a member? It's free to sign up.) That's the best clearance sale we've ever seen at J.Crew Factory. 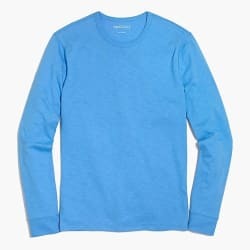 J.Crew Factory offers its J.Crew Factory Men's Long Sleeve T-Shirt in Mountain Stream for $16.99. Coupon code "QUICKEST" cuts it to $5.10. Plus, Rewards members bag free shipping on all orders. (Not a member? It's free to sign up.) That's $31 off and the lowest price we could find. It's available in sizes XS to L. Deal ends today. J Crew Factory [jcrew.com] has a 70% Off Clearance Items (prices ending in $0.99) with code QUICKEST. Sign up for a J Crew Factory Rewards Account [jcrew.com] (free to join) to get a 15% off unique code via email - or it may show in a bar on bottom of page if you sign up via the pop up. The email is received within about 5 min to gmail. Stack these discounts to get to prices below. Stay logged into your J Crew Rewards Account for free shipping. J. Crew Factory is offering an extra 70% off clearance items with promo code "QUICKEST". Shipping is free for Reward Members (free to join). Deal ends TODAY. 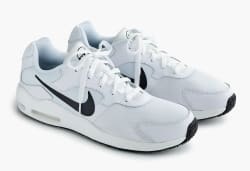 J.Crew offers the Nike Men's Air Max Guile Shoes in White for $89.99. Coupon code "SHOPTOIT" cuts that to $36. Plus, Rewards members bag free shipping. (It's free to sign up.) That's the lowest price we could find by $51. They're available in sizes 8.5 to 12. Deal ends January 27. J.Crew Factory takes an extra 50% off any two clearance items, an extra 60% off three items, or an extra 70% off four or more items via coupon code "EVENMORE." Plus, Rewards members bag free shipping on all orders. (It's free to sign up.) When buying three or more items, that ties our mention from two weeks ago as the best additional clearance discount and sale we've ever seen at J.Crew Factory. Deal ends January 27. Today only, J.Crew Factory takes an extra 60% off select clearance items via coupon code "BIGSALE" during its Clear the Clearance Sale. Plus, J.Crew Rewards members get an extra 20% off via the same coupon, and bag free shipping on all orders. (Not a member? It's free to sign up.) Some exclusions may apply. J Crew Factory [jcrew.com] has a 60% Off in cart discount on Clearance Items (prices ending in $0.99). Sign up for a J Crew Factory Rewards Account [jcrew.com] to get 20% off discount with code BIGSALE. When you sign up for an account, you will also get a 15% off unique code via email (received within about 5 min to gmail). Stack all these discounts to get to prices below. J. Crew Factory is offering an extra 60% off clearance items with promo code "BIGSALE". Reward Members log in to get extra 20% off on entire purchase (extra discount shows at payment page). Shipping is free for Reward Members (free to join).